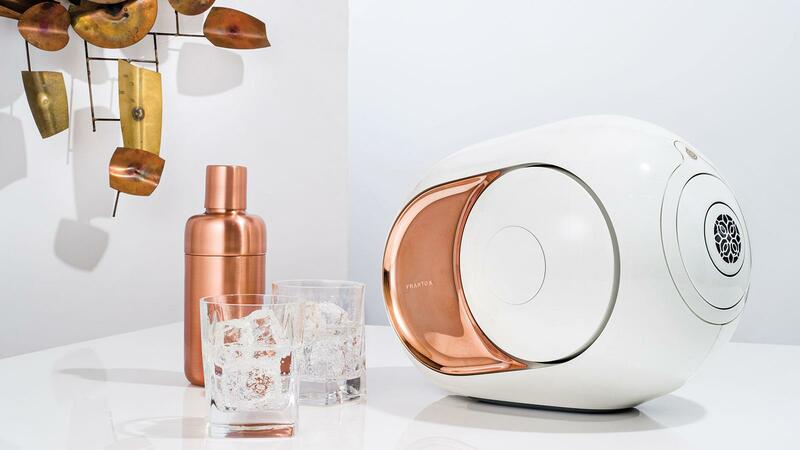 There’s no ignoring the futuristic curves and curiously ornate front grill of the Devialet Gold Phantom wireless speaker. It does, after all, look suspiciously like something that’s fallen off a NASA space station and gone adrift. But once you hear its dense, powerful bass, its precise midrange and its clean sonic purity, you’ll realize that you’re in the company of perhaps the finest-sounding wireless speaker to ever land in the realm of audio gadgetry. As otherworldly as it may seem to be, the Devialet Gold Phantom ($2,990) came not from outer space, but from France. It was there, after 10 years of research, that Devialet’s engineering team devised an analog-digital hybrid speaker. Its Class A analog amplifier is what achieves that coveted natural, analog sound. Several assisting Class D digital amplifiers provide extra power, which lets the analog amp focus on what it’s supposed to be doing—giving you the most detailed, distortion-free music possible. Devialet calls its system ADH (analog digital hybrid), and the Phantom is equipped with many more fancy-sounding acronyms. Take, for example, its HBI technology. That stands for Heart Bass Implosion and refers to its feisty, side-loaded subwoofers designed to deliver seismic bass as they visibly pump in and out of the unit, throbbing like a mechanical heart. As for the rounded, space-pod shape, it has its own acronym too. The ACE, or Active Cospherical Engine, operates on the premise that music fills a room in concentric acoustic ripples, so the sphere shapes the sound. There are, of course, more technical acronyms, but here are some specs instead: Encased in an ABS plastic shell, the 4,500-watt Gold Phantom stands about 10 inches high and weighs 25 pounds. It contains two aluminum subwoofers, one aluminum midrange and a titanium tweeter, all of which combine for a frequency response of 14 Hz to 27 kHz. Set-up is easy, requiring only one app to download and a power cord to plug in. It probably goes without saying that connectivity isn’t an issue. The Gold Phantom supports most music streaming services and easily plays music from your phone, tablet or computer—even directly from your CD player, assuming you want to go retro. And if one speaker isn’t enough, you can add another for vibrant stereo imaging almost guaranteed to put your senses into a state of future shock.